With July 4th right around the corner, our thoughts turn to barbeques, neighborhood parades and fireworks displays—events meant to bring us together with friends and family as we celebrate the establishment of our nation and its long fight for freedom. In keeping with the spirit of Independence Day, Amtrak is running a special train—No. 1776—on the holiday. Departing the nation’s capital late in the evening, it will allow passengers to watch the spectacular fireworks show on the Mall before heading north to New York and intermediate points. Railroads are strongly woven through our collective history and have been intimately involved in the country’s expansion by transporting people, supplies and ideas while also establishing economic links within and between regions. Railroad depots in communities large and small have also served as the backdrop to major life events for millions of people—departing home to start a new career, shipping out to war, returning to the embrace of loved ones—the stories are countless. Thus, it’s no surprise that the above Washington-New York timetable from 1975 features an electric E-60 locomotive against an unfurled early American flag. The image also tied into commemorations leading up to the major Bicentennial celebrations the next year. Taking a look inside, one can see that the trains running on the Northeast Corridor (NEC) once bore varied names. Many referenced Revolutionary War era figures and battles, such as the Minute Man, Valley Forge and Bunker Hill. 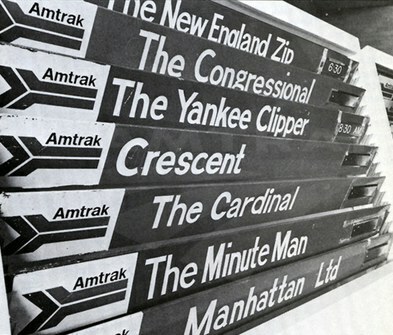 These names had carried over from the predecessor railroads that operated similar services prior to the start of Amtrak operations in May, 1971. Amtrak retained the colorful names until fall 1995, when all the Northeast Corridor trains were rebranded under the NortheastDirect umbrella and simply known by their numbers. Only the premium, high-speed Metroliner Service trains maintained a separate identity, which had been in place since their introduction by Penn Central in 1969. According to a November, 1995, article in the Philadelphia Inquirer, the NortheastDirect rebranding campaign included interior refurbishment of approximately 150 cars that received new seats, upholstery and carpeting.1 Four trains between Boston and Washington also gained new Custom Class service: for an extra fee, a passenger could take advantage of “reserved seats in a special car, free non-alcoholic beverages and newspapers, and hot or cold meals served in a dining car with fresh linens.”2 Amtrak advertised the new NortheastDirect service through radio and television spots. But the individual train names were not gone for long. Although still broadly branded as NortheastDirect service, the trains regained their individual identities within a year. The names would last until spring 1999 when they were again removed from the timetables. Another branding change followed the completion of the Northeast High-Speed Rail Improvement Project in 2000, which resulted in the electrification of the NEC between New Haven and Boston and set the foundation for all-electric service along the corridor’s entire length. At the end of that year, Amtrak introduced the high-speed Acela Express. Amtrak introduced the NortheastDirect brand in 1995. Today, travelers in the Northeast still encounter one patriotically named train: the Ethan Allen Express (New York-Rutland, Vt.), named after a Revolutionary War hero and founder of Vermont. The train that bears his name was established in 1996 and is especially popular with winter sports enthusiasts who visit the mountain resorts of Vermont to ski, snowboard and enjoy the beautiful landscape. Do you remember when the Northeast Corridor trains had individual names? Share your favorite one with us in the comments section below. 1 Tom Belden, “Amtrak Boosts Non-metroliner Service It’s Now The Northeast/direct Line,” Philadelphia Inquirer, November 13, 1995. 3 “New Amtrak Ad Campaign Promotes Re-launch of Northeast Regional Service,” Webwire, July 15, 2008.